Four excuses to hand out business cards as well as reasons to carry a bi-fold wallet. Aware: A participant draws/writes a free thought on a card and without ever coming in direct contact (that's what the audience thinks) you know exactly what has been drawn/written. ConFab: Squeezed B4C, so that it becomes easy. Drawing D: An impromptu Drawing Duplication. 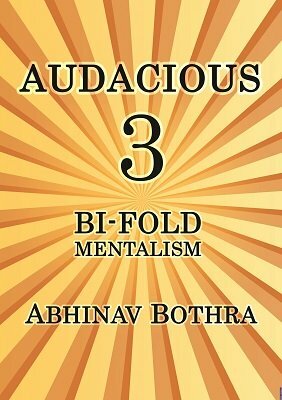 Q: What is Bi-fold Mentalism? A: It's a term I came up with for mentalism that can be performed with a Bi-fold Wallet. Q: What is a Bi-fold Wallet? A: Google 'Bi-fold wallet' and check out the images section. Q: Do these allow handing out business cards? A: Yes, all of them are perfect excuses of handing out business cards and none of them require gimmicks. Q: Close-up or Parlor or Stage? A: I prefer using these in close-up situations and would suggest to keep it that way. Q: I am a female, can I use these? A: Although these are designed to be used for a Men's Bi-fold wallet, but B4C and ConFab can be tweaked a little for a Women's clutches. Q: How hard are the tricks explained in here? A: In my opinion none of the tricks in here are for beginners. In technical terms: Aware and B4C - Intermediate, ConFab - Easy; Drawing D - Advanced.